Liam Moore is attracting interest from Premier League clubs including Manchester United, according to this morning's Daily Mirror. The Leicester City defender has stepped-up to the first team following injury to Sean St Ledger, having trained with the senior squad and made two appearances last season. His performances have impressed many and led the likes of Sir Alex Ferguson and Everton's David Moyes to keep an eye on the 19-year-old. 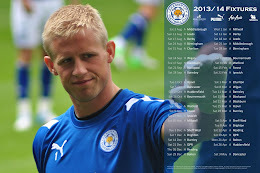 Moore made his league début in the Foxes' first Championship fixture against Peterborough and is one of a hatful of City players to have completed ninety minutes in all of Leicester's first four games of the 2012/13 campaign. Both United and Everton sent their chief scouts to watch Moore in action at Ewood Park as Leicester went down to a 2-1 loss against Blackburn Rovers, and Ferguson is understood to be keen to swoop for the defender before the transfer window slams shut on Friday. Leicester City boss Nigel Pearson is yet to comment on the speculation over Moore's future but has reacted quickly to quash pressure on the thrice-capped England under-17 international. "When you consider how he finished last season, he had two appearances and we won both games," Pearson told the Leicester Mercury, "He has had an opportunity this season which possibly he wouldn't have thought would have been there. He has taken the opportunity positively." Whilst Moore has impressed since graduating to the first team he remains a young, developing player and, whilst quietly impressed, Pearson is still reserved in his praise of the player. "Of course, he is playing alongside the captain and a player with vast experience. They have complemented each other well," added Pearson, "It is important not to put too much pressure on him and say he has made it. He has taken his chance well. He is still a very young player with lots to learn, but he is in there on merit and, if he keeps playing the way he is, he will take some shifting out of the side as well."